What advice do you give your students when they ask how they can improve their English? One thing that teachers often advise is that students need to immerse themselves in the language: listen to lots of English, frequently revise vocabulary, study the language and understand how the grammar affects meaning. There is a lot the teacher can help with but for students to really get ahead, time spent in the classroom is not enough; they need lots of practice outside class too. It is very important for a teacher to consider what students are doing outside class and provide guidance on improving their English. This goes beyond setting homework and should include highlighting tools and resources that students can use to develop their English skills every day. In many situations around the world students at secondary level and above have access to smartphones which offer a wide variety of apps through the app stores that can help. In fact there are arguably too many; search ‘Learn English’ in the Apple App Store or Google Play and you will be confronted with so many options it’s difficult to know where to start. One good place is of course the apps developed by the British Council with our world-renowned content written by teachers and mobile learning experts. That’s why, in this article, we are going to spend some time looking at the LearnEnglish mobile apps available from the British Council. You may already be aware of the apps, but you might not have downloaded them yourselves or shown them to your students and explained how they can benefit their English. The British Council offers a number of apps that together provide a holistic range of tools that can really help improve your students’ English. There are apps which provide listening practice, learning tools which can be used to study vocabulary and grammar and also some games for an entertaining approach to learning. Listening to English audio and watching English video is a great way to become immersed in a language. You hear accurate models of the language, hear how the language is used in context and build up competence in the language. Audio and video content also lends itself very well to mobile; people love having the convenience of accessing audio and video from their mobile device. LearnEnglish Audio and Video provides many of the British Council’s best audio series in one app. The benefit of having them in an app means that they can either listen on the go, or if they can use the screen too then can easily read along with the audio script; a great way to reinforce the language being listened to. They can also access this content offline which makes it very accessible. The audio script in the app includes a glossary with key words defined and there are comprehension questions available as well to help students with their understanding. There is even an option to slow down the recording if students’ find it too fast at the start, a common problem students find when learning English. A good way for students to feel they are making progress is to listen to the audio at the slower speed first and then listen again at the normal speed. Other listening resources include LearnEnglish GREAT videos, which is a free app with the same features as LearnEnglish Audio & Video with 24 videos about life in the UK. 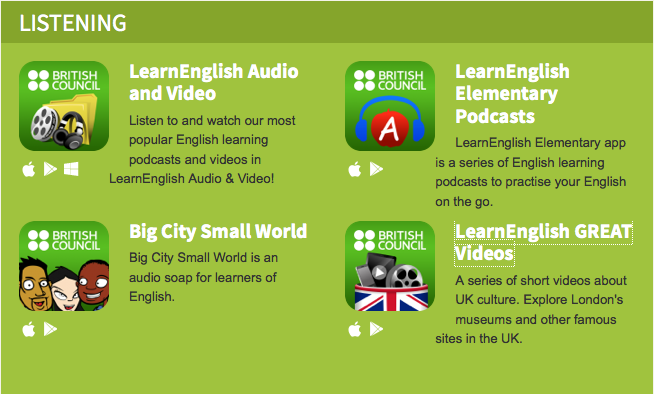 LearnEnglish Elementary Podcasts and Big City Small World are two further apps that provide access to those two popular series from our LearnEnglish website. 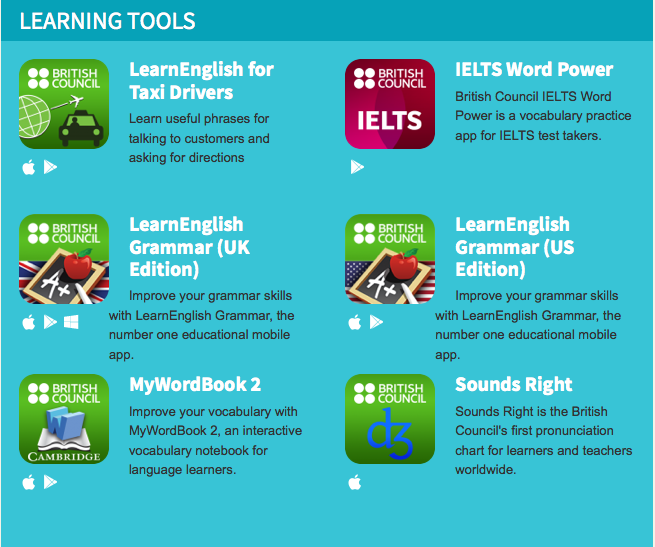 Some of the LearnEnglish apps are focused on the systems of English – grammar and vocabulary. LearnEnglish Grammar provides grammar practice across all grammar areas split into question packs available at different proficiency levels based on CEFR levels (A1 – C1). These have been given user-friendly names such as Beginner Pack 1, Beginner Pack 2, Intermediate Pack 1, Advanced Pack 1 etc.. The content for each question pack was based on the grammatical structures as described in the British Council | EAQUALS Core Inventory for General English. This links different grammar areas to the CEFR levels that these structures are most necessary. (For more information on the Core Inventory see http://www.teachingenglish.org.uk/publications/british-council-eaquals-core-inventory-general-english). The Core Inventory splits grammar topics into a number of topics and sub-topics. The content in LearnEnglish Grammar is based on these sub-topics with a variety of exercises for each grammatical area. The content has been written so that it first introduces the target language in context, through the use of imagery and audio, with simple questions to get students to notice how the pattern of language is used. The questions then get progressively more difficult allowing students to build on their understanding of the patterns until they are producing the language. This form of scaffolding is very important to students when they are studying by themselves. Students will also learn new words from this practice. When they do, they can enter them into another of our apps: MyWordBook. MyWordBook is a vocabulary tool for learners so that they can create flashcards which can then be reviewed in order to remember them. These flashcards can be discrete words or larger lexical chunks. The students can add definitions, translations and sample sentences as well as use the camera on the phone to take a picture of the word if that is appropriate and use the microphone to make a recording of the word or sentence. The students could even ask you to do this part for them if they want their teacher to model the language. MyWordBook also allows user-created flashcards to be shared between learners which can be useful when students are in the same class or at similar levels and have similar needs. Flashcards also sync across devices; as many people now have multiple devices – maybe a smartphone and a tablet – it is useful to be able to review these words on any device. Having flashcards on a phone provides a great opportunity for frequent revision, something that is very important in order to get the lexis into the long-term memory. Frequent reviews of a few minutes on the bus or while killing time can be all it takes to memorise words and improve students’ vocabulary. MyWordBook also comes with packs of purchasable flashcards which use dictionary entries from Cambridge University Press and display these in flashcard form. When thinking about mobile apps, people often think about games – and the British Council also offers a few language games for students to enjoy. The latest is Johnny Grammar’s Word Challenge which provides a quiz format to test students’ knowledge of vocabulary and grammar. Students have 60 seconds to try and get as many questions right across a range of lexical and grammatical areas at various levels, and if they succeed they are rewarded with badges to collect. 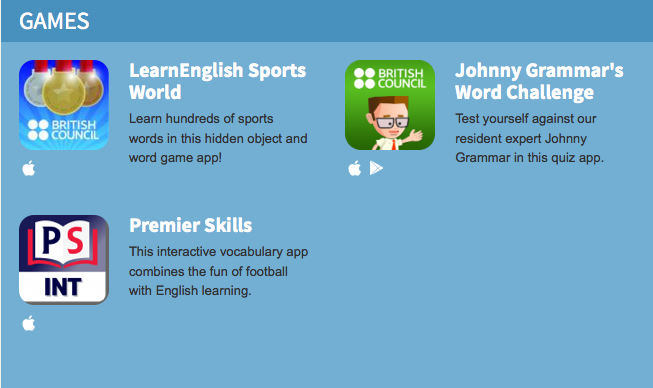 For students who are into their sports, they may also like the LearnEnglish Sports World app. This is a hidden word game where students have to label all the sports and equipment in a detailed sports scene. Put these tools together and you have a comprehensive set of resources to make regular, independent English language practice fun and accessible for your students. Each of the apps has been designed to focus on one area of language, and altogether they provide a complete set of tools. You can download a PDF version of our presentation of the apps to show your students below. You do a practice of English word in conversation, it is the best way to learn new words along with proficiency. Apps and online tutors also provide teaching help so Keep practice with them. Thank you for the post. I have downloaded IELTS vocabulary app which has step by step special topic based exercises with listening of the new academic words including spelling tasks in it. I noticed that I started to remember and use them in my essays.